(Video) Inked Awards 2016 Aftermath with Leigh Raven, Small Hands, and More! 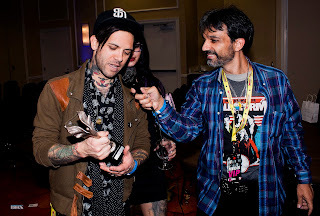 After the Inked Awards were over I got the chance to catch up with two of that night's winners, Small Hands (Male Performer of the Year) and the lovely Leigh Raven (Feature of the Year), about their victories. The results and answers are as fun and wild as you would expect, as other members of the Burning Angel family also joined in, among them gorgeous Nikki Hearts, who is also Leigh's wife.